A recent story in The Manitoban included an interview with David Barnard, President and Vice-Chancellor at the U of M. It’s an interesting read, and includes Barnard’s perspectives on international students attending the University, as well as the need for more student housing. 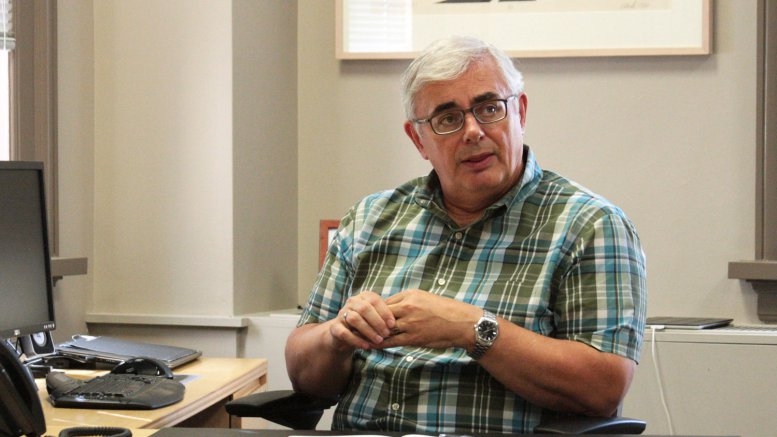 David Barnard, the president and vice-chancellor of the University of Manitoba, has faced his share of controversy. This year alone, Barnard has had to deal with the fallout from $14.4 million worth of cuts in this year’s operating budget, a 10-to-18 per cent hike in international student fees, and two Canadian Association of University Teachers (CAUT) investigations into alleged misconduct at the U of M.
Most recently, the Manitoban reported that the department of economics is preparing to split into two academic units due to personal and ideological disputes among faculty members. CAUT is even preparing to censure the university if it does not resolve the matter. Since becoming president of the U of M in 2008, Barnard has dealt with the threat of a faculty strike over academic freedom issues and has been embroiled in debates over post-secondary education funding. He has signalled that the university will make another round of budget cuts this academic year and has argued consistently that Manitoba’s tuition fees are too low to meet the financial requirements of the university. But the former computer science professor and president of the University of Regina is not interested in popularity or even whether he will be remembered as a great university president. As part of this mission, Barnard has been busy implementing the key tenets of the University of Manitoba’s 2015-2020 strategic plan – namely, strengthening its teaching, improving its research output, bolstering achievement for indigenous students, and building community through new campus planning and development. As part of the implementation of this plan, the university has been engaged in its Visionary (re)Generation planning process, which will eventually result in the build up of the Southwood lands into new campus housing, retail, and other development. This fall, the U of M will also officially launch its $500 million Front and Centre campaign to attract private donations to the university. Moreover, the campus remains committed to attracting more indigenous students and will house the permanent records of the Truth and Reconciliation Commission, which recently completed its nation-wide investigation into the Indian residential school system. The Manitoban conducted an extensive interview with Barnard last week. The following are the highlights of our wide-ranging conversation with the president and vice-chancellor on current controversies and his vision for the University of Manitoba. The interview has been edited for length. MANITOBAN: Ultimately, as the president of the university, what is your preferred outcome when it comes to the proposal to split the department of economics and the negotiations being led by the dean of arts? BARNARD: My preferred outcome is that the faculty collectively can find a way forward that is going to be good for students and for the department and for the delivery of its programs and services. M: But what would that look like to you? Do you view the department staying together as a priority at this point? How important is it for the department to stay together? B: I think that is a question, frankly, for the department to decide. We have a group of colleagues, they have working relationships, they have programs they have defined over the years. There is some stress there, and they are trying to find a way forward, and frankly I think in our collegial governance model the onus is there for them to find a way forward. University presidents don’t typically interfere in the governance of departments or faculties. It is not our role. M: Are you concerned at all about CAUT’s motion to censure the U of M? What is your response to that? B: Well, certainly we would prefer not to be censured by CAUT, but that’s a decision that they will make. We will make a decision to do the best things that we think we can do within the responsibilities that we have […] I don’t think the report that was written justifies the action they are threatening to take. M: Over the past year, in terms of dealing with the budgetary challenges of the university, what were the issues that were top of mind for you when determining where to cut resources and what things to prioritize? B: The next strategic plan, which will guide us for the next five years, was passed unanimously in Senate and by the Board [of Governors] last year, and that has a number of priorities that are identified. So when I and my colleagues in the president’s executive team start thinking about the budget and as we’re working through the process, we keep in mind the priorities that are in that plan. Those involve, in our language, inspiring minds – the focus on teaching; driving discovery and insight – the focus on the research mission of the university; creating pathways to indigenous achievement, which is particularly significant here on the Prairies and particularly significant to this university and this province; building community, which is building the campus environment, which allows us to have a really outstanding place for people to learn and work. And the fifth one is forging connections to the community. So at a very high level, those are the sort of filters we use to look at the budget and say “how do we best allocate [resources] to drive these priorities?” Then we work down, right? We work down from there. M: In terms of this past budget, the university signalled that there were going to be four per cent cuts across the board, but not every faculty faced the full four percent. The education and environment faculties faced 3.5 per cent cuts, and business and science faced 2.5 per cent in cuts, while music was cut by 3 per cent and engineering by 2.2 per cent. What was the justification for that? B: In some cases, there has been enrolment growth, in some cases there has been the need to respond to specific local circumstances in some of the units, whatever they might be – facilities, more people assisting in teaching or whatever. In each of those cases, we looked and determined that everyone needs to share in the difficulty, but there are some specific things that are happening in some of these areas that we need to respond to, so we responded differentially. M: What can the university community expect from next year’s budget? You signalled in the fall that the university will cut its operating budget by another four per cent. Is that still in the cards? B: Yes, it is still in the cards. That will be the way we move forward. But we don’t know exactly where it will end up until the budget is sent by the province in the spring, but to do our planning we need to move ahead with some reasonable expectation and that expectation we will use in our planning. Now, that [four per cent] is a complicated number, right? Because while we talk about cuts in the units at the end of the process, the units will end up with more money, they just won’t have enough money to cover the costs that they currently have extrapolated forward. M: One of the issues that has been brought up by those that are opposed to cuts at the university has been transfers from the operating budget to capital. Can you elaborate on why typically, in a given year, there will be a fairly large transfer from the operating to the capital budget? Is there some kind of government funding that is lacking in terms of funding the capital side? B: I’m a computer scientist, not an accountant, so an accountant might explain it in technical terms. But basically what the capital budget does is recognize our expenditures on items that have a continuing value; things that are dealt with within the year are operating expenditures. So paying someone for work they are doing now is an operating expense, buying paper to print handouts for a class is an operating expense, but buying a computer that might be used over several years is a capital expense because it is not just consumed in the short-term, it has some lasting value. Generally accepted accounting procedures require that we make that differentiation, but in terms of the work of the university, those capital expenditures, whether they are pieces of equipment or enhancement of facilities and so on, those are things we need to do our work. What happens at the end of year, really, is not a transfer into a fund that is designated for something unspecified, but a recognition at the end of the year that a lot of money has been spent on those things because that is part of the way that we do our work. It is just natural and normal and there is nothing unusual or wrong about it. Most of the transfer from operating to capital is of that sort, and we can expect that it will continue to be that way because that is just the way we operate and the way we report what we do. M: Also on the budgetary side, there was quite the controversy over raising tuition fees for international students. What was the thought process behind that and what ultimately led to the decision to increase fees for international students? B: We’re under considerable financial pressure as we’ve already been discussing. The tuition fees that we charge to international students were low relative to other universities like us in the country, and we moved them up. We have not moved them up as much as most of the other universities in the research intensive group across the country, but we have moved them up a little bit, and that was a flexibility that we had and we thought it was appropriate. It certainly is an advantage for the University of Manitoba and its students and for Manitoba to have international students here, but it is an interesting and a hard question to ask how much should international students pay relative to national students who are part of the economy that is also paying the taxes to pay for the cost of the university. M: How do you strike that balance between an acceptable tuition rate for international versus domestic students? Is it simply looking at a comparison to other universities across the country, specifically U15 universities? B: Well, certainly one thing that many organizations do is to compare themselves to their peers and see what their peers are doing. That is what we have been trying to do in this area and several other areas. When we look at what is happening at our peer institutions with respect to domestic tuition fees, we are very low. We were very low with respect to international fees and we had some room to manoeuvre so we manoeuvred. M: How do you respond to the criticism, and this criticism has been made about universities across the country, that universities are recruiting international students to offset low domestic tuition and to shore up their operations that way? Do you think that is an unfair criticism? Is the concern justified? B: I think that internationalization is driven by wholly other considerations than cost. Canada is a country made up mostly of people who have come here from other places, right? And it is important that we continue to be connected to the rest of the world as a society and one important place to do that is through the universities. We think that it is important as a university to send our students other places and we think it is important to bring students from other places here. This, I think, helps build better awareness of the world. It has very pragmatic implications for connections people form when students from other places come here and return home, they often are some of the best advocates for Canada […] and similarly when we send young people from here abroad, they learn more about the world and come back thinking differently about it. I think the drive to internationalization is not a financially motivated one, it’s actually motivated by a much deeper set of considerations. M: The $500 million Front and Centre campaign officially starts this fall. Over the past year, the university has received $37 million in private donations, with over $26 million of that coming from alumni donors. Do those numbers give you hope that you can reach the goal in the Front and Centre campaign? What is the deadline for the $500 million? B: The campaign is going to be spread over several years. A lot of things will become much more clear within a month or so because we are going to have an official launch of the campaign so I think a number of the questions you are asking will be clarified then. I will ask you to wait until we publicly announce it. But with respect to the general question about how realistic it is for us to reach for that number, I think it is quite realistic. We have got some really wonderful support in the community, and commitment to helping us raise that money […] The priorities in the campaign align very well with those in our strategic plan and we’ve gotten a lot of interest so far. M: In terms of the Visionary (re)Generation development plan, what do you hope to achieve with that plan in terms of what the campus looks like and how students interact with the campus? And how much of the plan is contingent on rapid transit development around the U of M? B: What the Visionary (re)Generation project has done is step back and look at the entire area that the university now occupies, including the Southwood golf course. The acquisition of the Southwood lands presented us with really an unavoidable opportunity to think about how we want to use that land and how does that get integrated into a larger picture of the existing campus and its various components. What the plan is doing is looking at an integrated view of all of these things, taking into account the needs the university has at present and can predict for expansion of different sorts. We certainly need more space for students. We have a lower percentage of our students living on campus than is true of most universities our size, and certainly for other research universities. We want to have a plan that will survive over a long period of time; a decades-long plan. Public transit is certainly an important part of our thinking about the university because we would like to see increasingly people using public transit to get here. We’re really pleased with the collaboration we’ve had with the city. The announcement of the plan for transit is good for us, and we’re going to start seeing development on campus of a transit hub that will connect up with the rapid transit further north of the city. The ideas that have been identified and the way they have been put together in a plan has been done very, very creatively. I’m really quite excited about that project […] The ideas that are in the plan are ideas that can survive for a long time. M: You sound very passionate about this project. Ultimately, what do you want to be remembered for as the president of the University of Manitoba? Is this one of those things? And what else is on that list? Some historian starts digging into it and looks back and says “you know, there was something really pretty amazing that happened in that decade, from 2020 on, and as I dig into it what I find is that the team that was leading the university before that period built the platform from which those folks in the 2020’s launched a rocket.” It wouldn’t bother me not to be remembered, but I want to be part of the team that built the platform from which the next team launches the rocket.